The impeller of an HSC pump is dependent on even water flow entering the eye (or inlet) of the impeller. There are two entry points of water into an impeller of an HSC pump, which is where the term “double suction” is used. If water enters the impeller unevenly, hydraulic imbalance can occur and cause stress to the pump shaft or bearings. The need for smooth, laminar flow in the suction piping of an HSC pump is precisely why the NFPA 20 has strict rules regarding the length of straight piping required on the suction side of an HSC pump (see NFPA 20 2013 4.14.6.3.1, and 4.14.3.1). As a general rule, the larger the volume of water to be pumped, the more important it is to have smooth laminar flow of water into the pump casing. 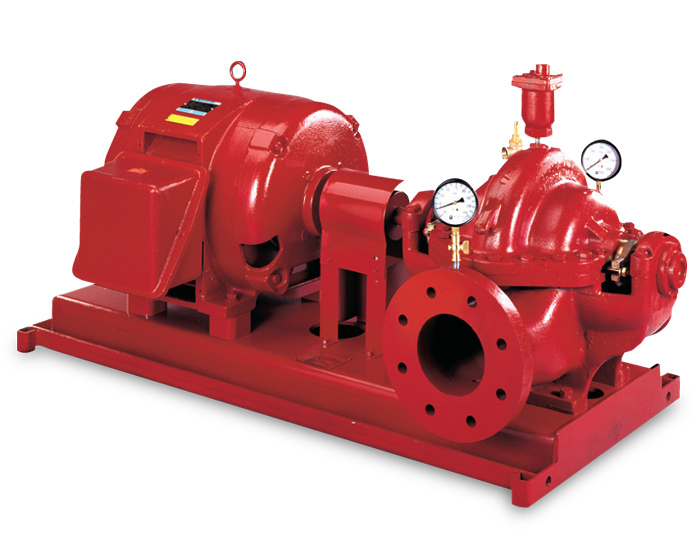 The orientation of an HSC fire pump must be predetermined when such a pump is manufactured and installed. The pump must be built for either right-hand (clockwise) or left-hand (counter-clockwise) from the vantage point of the driver. For diesel-driven fire pumps, the pumps can only be operated at a clockwise rotation. Failure to pay attention to this can lead to a pump that must be taken apart then reassembled in the correct rotation in the field (if the pump is driven by an electric motor), or piping that must be rearranged in the case of a diesel engine-driven fire pump. Finally, due to the extra bearings, larger impellers, and overall larger size of the horizontal split-case fire pump, the cost is higher when compared to a pump with a cheaper design. The higher initial cost does afford you a pump that will last longer, and will be easier to maintain or service when compared to other pump types. End suction centrifugal pumps get their name from the pathway the water takes to enter the pump. Typically the water enters one side of the impeller, and on horizontal end suction pumps, this appears to enter “the end” of the pump. Unlike the HSC the suction pipe and motor or engine are all parallel, eliminating the concern about pump rotation or orientation in the mechanical room. Since water is entering one side of the impeller, you lose the ability to have bearings on both sides of the impeller. Bearing support will be either from the motor itself, or from the pump power frame. This prevents the use of this type of pump on large water flow applications. 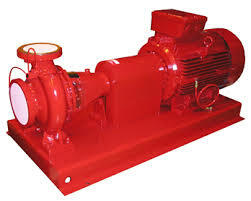 The appeal of an end suction pump is usually its lower initial cost. If the pump can perform at a given rating and pressure, then this type of pump is adequate. If diesel-engine driven, another advantage is the ability to have an engine parallel and close to a wall (assuming proper air venting is considered). This can save space in a mechanical room piping layout. The removal of the impeller requires pulling the impeller back out of the casing, which requires removal of the motor to provide space for this to happen. Often this is a more difficult procedure for those maintaining the pump. The process of water entering the impeller is identical to a horizontal end suction pump, but the casing is designed so that the motor is mounted on top, and the pump flanges are made to coincide with the same elevation centerline (hence the name “in inline”). As far as centrifugal pumps go, this requires the smallest space in a pump room. These pumps are also available to take advantage of smaller fire pump ratings – 50 GPM, 100 GPM, 150 GPM, etc, often with single phase electric motors. Historically, HSC pumps have been manufactured at only 250 GPM and 500 GPM ratings. The vertical inline pump helps fill in the gaps of pump GPM ratings. The mechanical design of a vertical inline pump (VIP) is the least expensive – the pump impeller is attached to the motor shaft, and is cantilevered in the pump casing. There is essentially no pump shaft – only a motor shaft. Once again there is no hydraulic balance needed for the water entering the pump volute, but you have minimum bearing support for any operational vibration. This results in a limited use in fire pumps above 750 GPM. Units are allowed up to and including 1500 GPM, but that might not be recommended depending on your pump room size. Should any debris get clogged in the pump impeller, the motor and impeller rotating assembly must be lifted up and out of the pump casing together, while still assembled. For large motors this can be a difficult task. If the motor size exceeds 50 HP, special lifting equipment may be needed. Since these pumps are typically chosen for their small size, the pump room itself may be small as well. One should ask, “Is there enough room to perform this function in the future?” An allowance for space to accomplish future repairs should be made (see NFPA 20 2013 4.12.1.1.6). The NFPA 20 (2013) 4.12.1.1.6 cautions installers of any pump room to allow for proper space for clearances between equipment and for proper servicing of the equipment. Vertical shaft turbine (commonly referred to as “vertical turbine”) pumps are unique in that the impellers are intended to be submerged in the water source. They are used for installations where the water source is below the pump impellers. These pumps have a bowl assembly which contains several impellers on a vertical shaft – where the discharge of one impeller directly feeds the suction of the next impeller, and so on – a column assembly built to a specified length, and a discharge head assembly which holds the motor or right-angle gear drive. In a mechanical room, the discharge head assembly of a typical vertical turbine pump is the only visible part of the pump. These pumps are helpful in areas where water is scarce, but also when installing an above-ground water storage tank is not desirable. An added advantage to a vertical turbine pump is that almost any length and discharge pressure of the pump can be ordered. Several impellers can be added for additional pressure. When properly installed, there is no longer a concern about air in the suction pipe, or any of the priming concerns. With each additional impeller added, you are adding to the pump “churn” or shut-off point on its curve, so additional unwanted pressure is often seen at lower operational flows. This pump does come with a few disadvantages. Besides the additional initial cost, these pumps can be challenging to service. One must remove the pump or disassemble it, which often requires use of a roof hatch in a room so that a crane can lift it out for examination. Since these pumps are all custom-built, the lead times can also be long – from 8 to 20 weeks depending on the manufacturer and models. Special care must be made before operating a vertical turbine pump for the first time – the shaft and impellers must be properly adjusted to lift them off of the bowl casings prior to operation. Rotary gear pumps are used for a wide variety of pump applications and are useful to pump liquids with high viscosity or low NPSH requirements. Unlike the other pump types discussed, a rotary gear pump can be built for self prime. Due to its very small size, portable rotary gear pumps are often used in rural areas to pump water from ponds or streams. The rotary gear pump operates through positive or “fixed” displacement of the liquid being pumped. This is accomplished through pump gears which move a specific amount of liquid per gear revolution. 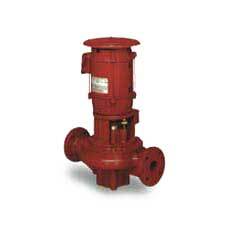 There is no throttling this type of pump, so a relief valve is required for its use. 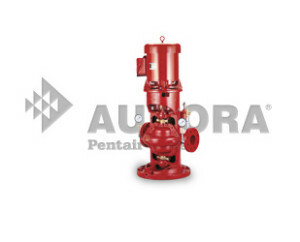 In the fire protection field, rotary gear pumps are especially used for high pressure and high hazard applications – specifically to handle foam concentrate. Some brands (such as Edwards) can operate dry, since the rotating elements never touch due to timing gears. This is extremely important when operating with foam and petrochemical products. While these pumps are smaller than their centrifugal counter-parts, they are infamous for their extremely loud operating noise. While they have a wide range of liquid applications, their hydraulic efficiencies are slightly less than other types of pumps which is why they are not often used with water at ambient temperatures. Any of these pumps can be discussed more in depth, but the purpose of this blog is to cover the most popular pump types and to help the reader understand the basic differences between them. 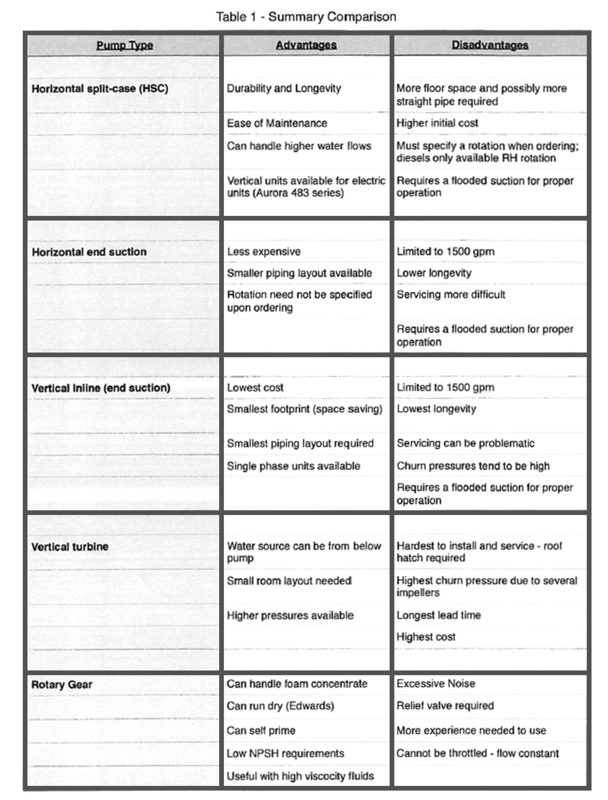 The summary table below should help call out the advantages and disadvantages of each pump type. When unsure, please contact the professionals here at Steven Brown & Associates, or your local pump professional for advice.